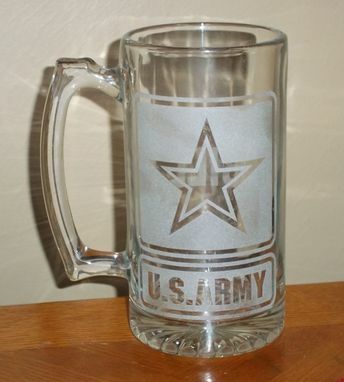 This is for custom etched sport mugs. Each is handcrafted (sandblast etched) by me. These mugs are a heavy glass and hold approximately 25 oz. Pictures are of works I have done in the past, and can be reproduced within a day. We can do any NBA, NFL, NHL, MLB, or NCAA team's logo. Those with logos are not officially licensed. Feel free to submit a request for a specific design you may need. If you want a specific team's logo or any of the mugs pictured, simply include this information in the order comments. Dimensions: 7" tall, 5"x5" including handle.